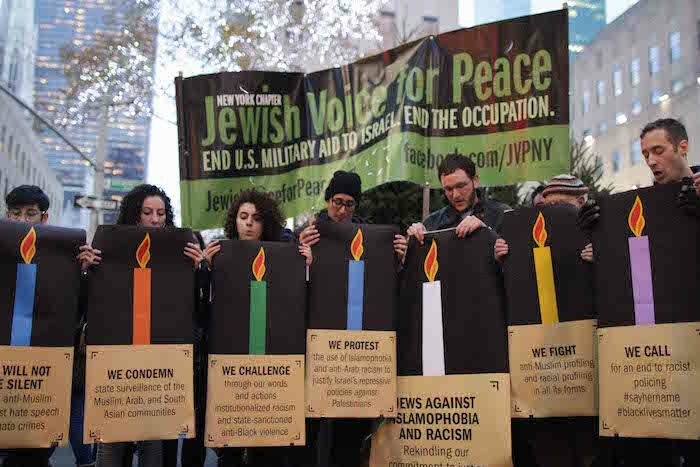 December 6, 2015 — This week, American Jews are participating in a series of nationally coordinated actions against Islamophobia and racism to mark the eight days of Chanukah with a rekindling of their commitment to justice. Beginning Sunday, December 6th at 4pm in Rockefeller Center in New York City, each night of Chanukah Jewish activists and community members will gather to make public commitments to challenge state-sanctioned Islamophobia and racism and to call for the United States to welcome refugees. Each of the commitments is articulated through a sign that is in the shape of a candle; the candles together are in the shape of a menorah. Actions are happening each night in 15 cities across the country—New York City, Miami, Chicago, Washington, DC, New Haven, Portland (Oregon), Durham, Columbus (Ohio), Seattle, Atlanta, Boston, Ithaca, Springfield, Denver and Providence. Jewish Voice for Peace is a national, grassroots organization inspired by Jewish tradition to work for a just and lasting peace according to principles of human rights, equality, and international law for all the people of Israel and Palestine. Jewish Voice for Peace has over 200,000 online supporters, over 60 chapters, a youth wing, a Rabbinic Council, an Artist Council, an Academic Advisory Council, and an Advisory Board made up of leading U.S. intellectuals and artists. Jewish Voice for Peace is taking a stand against Islamophobia and profiling of any kind. We're distributing these shirts at cost as part of our ongoing organizing against Islamophobia and anti-Arab racism. This 'Refugees Welcome' poster defies Islamophobia and publicly declares our solidarity with refugees everywhere, from Syria to Central America to Palestine.